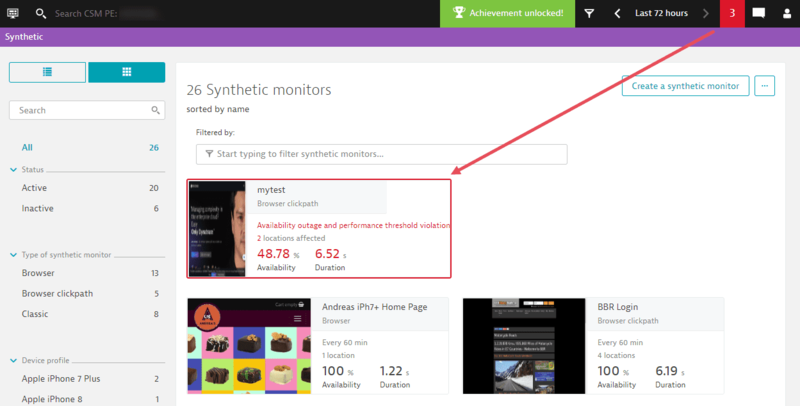 Single-URL browser monitors and clickpaths in Dynatrace Synthetic Monitoring enable you to monitor availability and performance. Whenever a synthetic monitor fails for either an availability or performance issue based on your thresholds, it creates a problem. 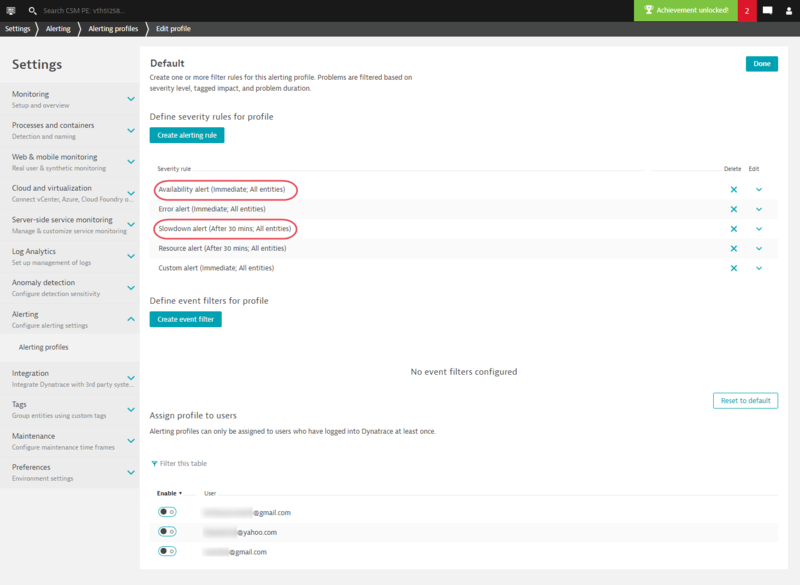 Define integrations for alert delivery, for example, via email. 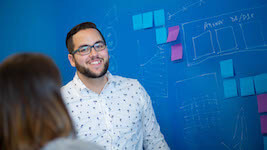 Create alerting profiles to determine which problems trigger notifications and when, allowing you to define different levels of urgency and customer impact by varying alert delivery by problem type and duration. 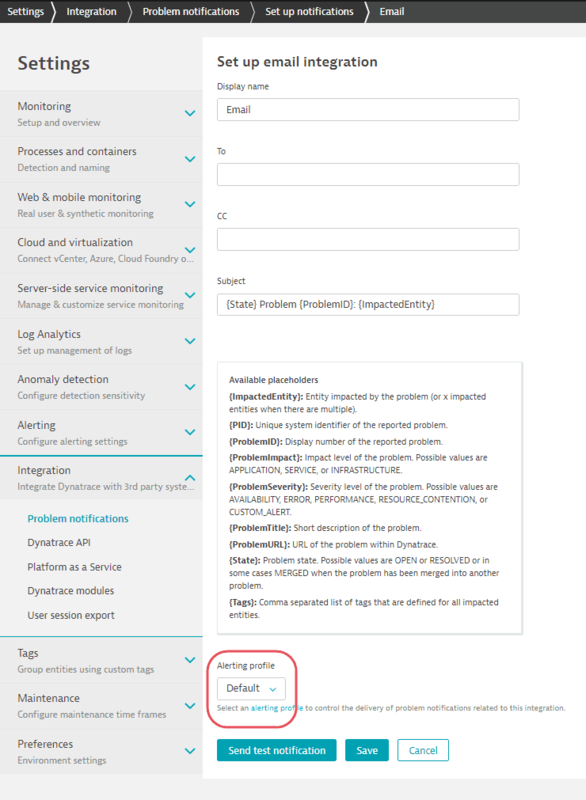 Even if you don&apos;t set up any integrations, problem notifications are automatically sent to the Synthetic dashboard and the Dynatrace mobile app. 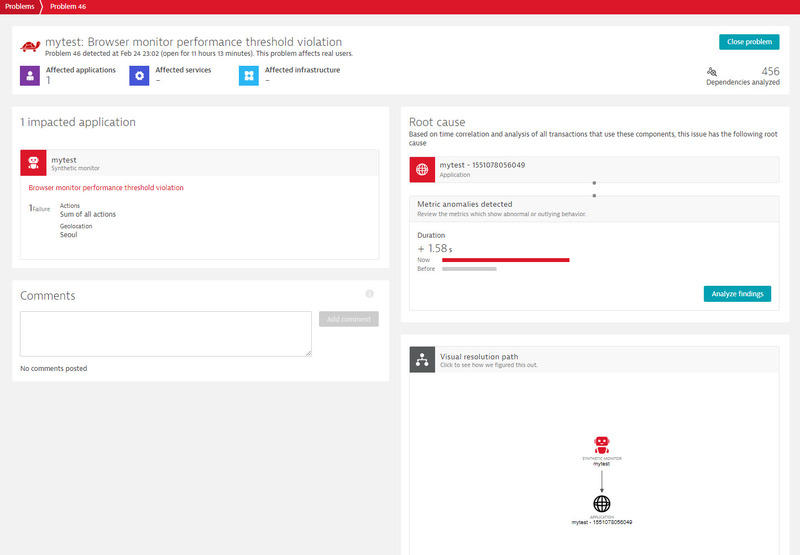 Whether or not you see problems in the dashboards and receive alert notifications during maintenance windows depends on how you configure them. 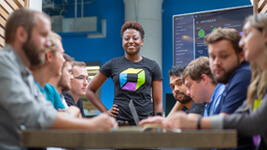 Dynatrace Synthetic Monitoring&apos;s alerting potential is fully realized when combined with Real User Monitoring and full-stack application monitoring—not only are you notified that there is a problem, you can also see which real users are impacted and where the root cause of the issue is in your application stack. Alert thresholds are specified in synthetic monitor settings after monitor creation. Navigate to the Synthetic dashboard and select your monitor. Click the ellipsis button and select Edit. See Configure a browser monitor for details. Be sure to Save changes to monitor settings. While recording and editing clickpaths is based on events, performance thresholds must be specified for the monitor as a whole and/or individual actions. See Number of actions consumed by browser clickpaths for the difference between events and actions. 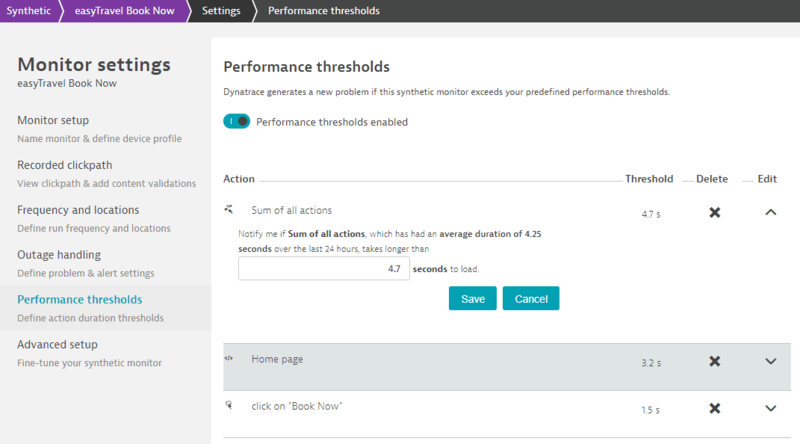 When performance thresholds are enabled, a Sum of all actions threshold of 10 seconds is added by default. You specify a static performance time in seconds (to meet an SLA, for example), and you can base this number on the displayed average performance over the last 24 hours. Average performance values are displayed for the monitor as a whole as well as for individual events. 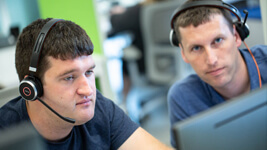 We recommend you set these thresholds at least 24 hours after monitor activation so you can refer to the average performance data displayed here. A synthetic monitor in violation of a threshold generates a problem. A monitor in violation of a single availability threshold (global availability or consecutive failures at a selected number of locations) generates one problem, regardless of the number of occurrences. If a monitor violates two thresholds, two problems are generated. A monitor violating performance thresholds for the monitor as a whole and/or individual actions generates a single problem per location. For example, if my monitor violates thresholds for the Sum of all actions as well as an individual action at two different monitoring locations, I see two performance problems, one for each location. 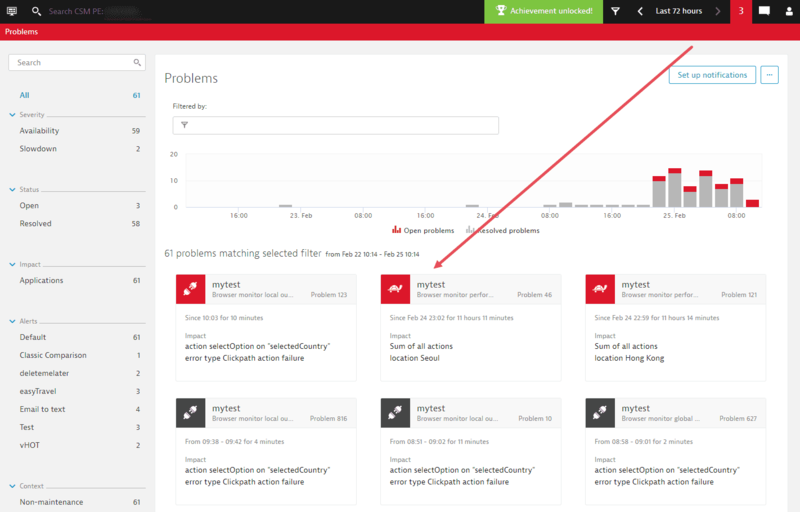 In the Dynatrace portal, a problem notification area for active problems appears at top-right. Any monitors with problems are outlined in red on the Synthetic dashboard. Select the monitor in question to view the details page and a list of its problems active and resolved problems in the selected time frame. Click a problem to drill through to problem details. 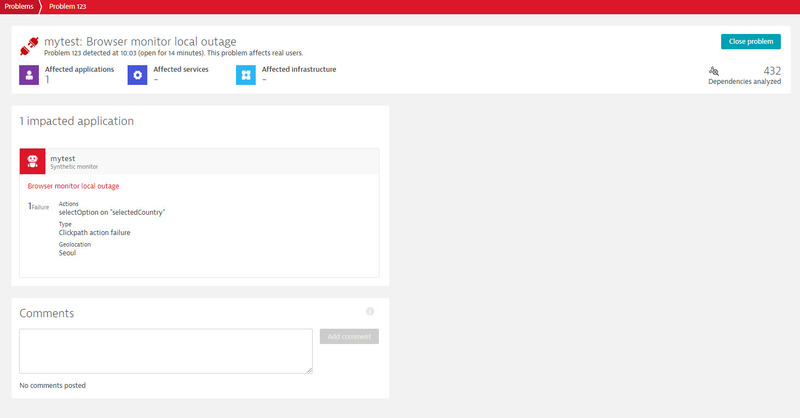 You can also access all problems from the Problems dashboard. The images below show the dashboard and the details for a performance and availability (local outage) problem. 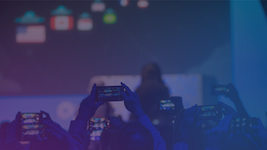 Simply sign in with your credentials to receive push notifications for the environments you have access to in the Dynatrace mobile app for iOS and Android. Synthetic Monitoring allows you to integrate with many third-party systems such as email for problem notification. Navigate to Settings > Integrations > Problem notifications > Set up notifications to set these up. You can also select Set up notifications from the Problems dashboard. 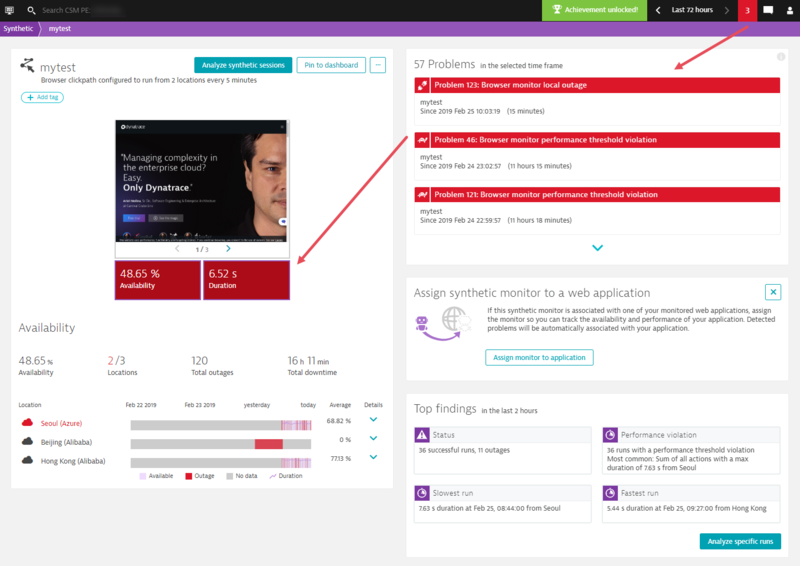 Problem notifications are automatically pushed to the Synthetic dashboard and Dynatrace mobile app, even if you haven&apos;t set up other integrations. Each integration involves setting up a template for communication, specifying recipients, URLs, credentials, etc. You can choose from several fields to customize these. You can set up your own integration using web hooks. An integration is always associated with a single alerting profile, which separately defines when the alert is delivered and for which entities and problem types. Initially, the integration uses the Default alerting profile. You can modify this and add your own. To start receiving alerts, add your email to an email integration, for example, and associate it with an alerting profile. Ensure that the integration is set to Active. To stop receiving alerts, remove your email from an email integration, for example, or deactivate or delete the integration. 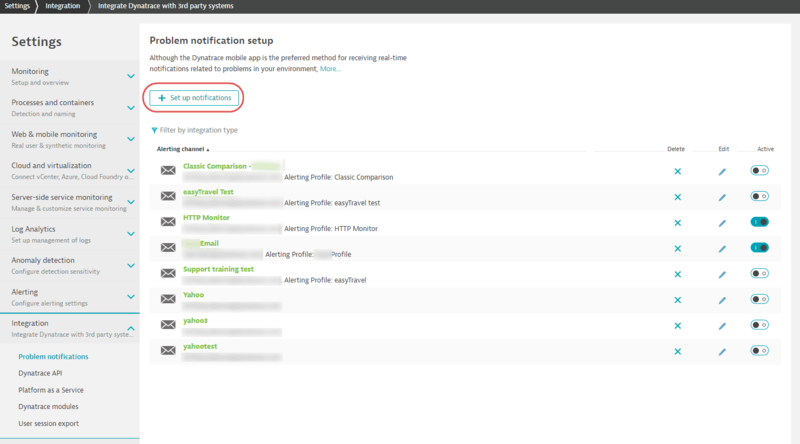 Alerting profiles allow you to control exactly which conditions result in problem notifications and when. Navigate to Settings > Alerting > Alerting profiles. 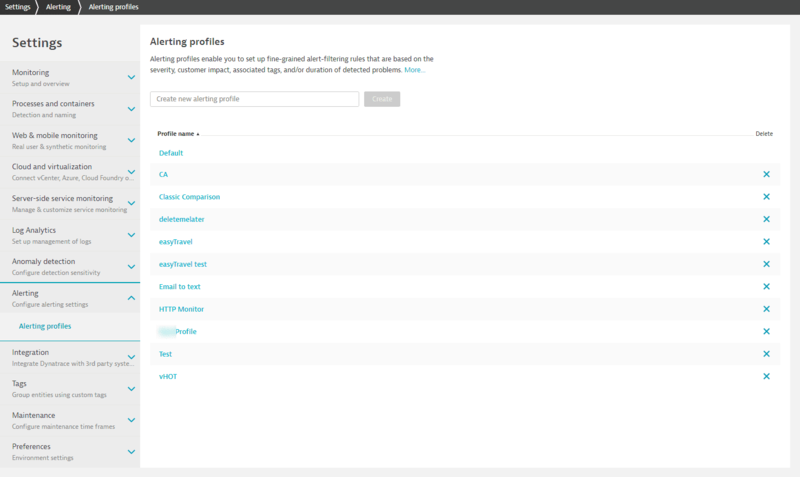 From here you can name and Create a new alerting profile; click an existing profile, for example, Default, to edit it. 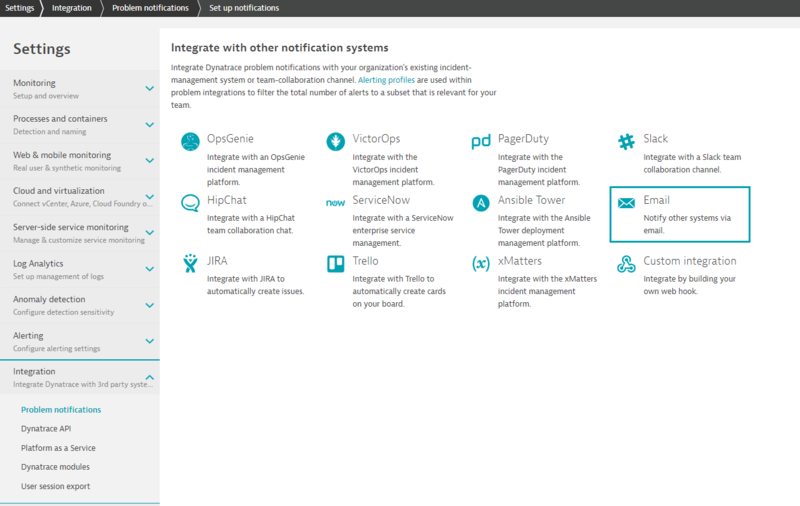 Alerting profiles created here are listed to choose from when setting up integrations for problem notifications. 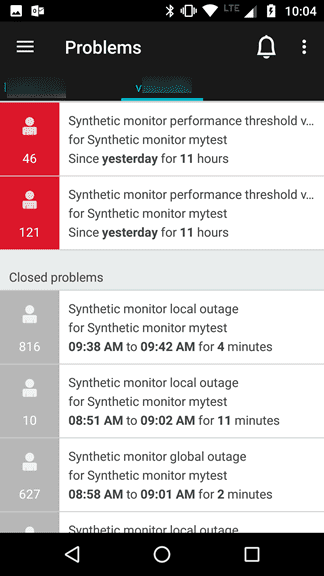 Availability and Slowdown alerts pertain to Synthetic Monitoring. 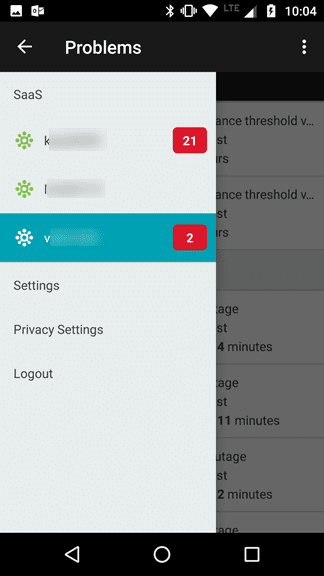 By default, the system alerting rules trigger notifications immediately for availability and after 30 minutes for slowdown performance problems; you can adjust these as required. Using alerting profiles and integrations, you can set up varying levels of severity based on problem type and duration. For example, the Default profile sends Availability alerts immediately and Slowdown alerts (for performance issues) after 30 minutes. You could associate different alerting profiles with different email recipients (integrations) to escalate a problem based on its duration. For example, you might want to notify your NOC immediately but send notifications to the business unit only after an hour. You can also use tags to determine which monitors should trigger these alerts, for example, you could use tags to allow only the most sensitive tests to trigger alerts to certain stakeholders. Maintenance windows are one-time or recurring time periods during which problem detection and/or alerting is suspended. You can also opt to continue with problem detection and alerting during the window. 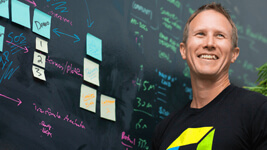 Set up maintenance windows by navigating to Settings > Maintenance > Maintenance windows. In particular, the setting below allows you to suspend problem detection and alerting. 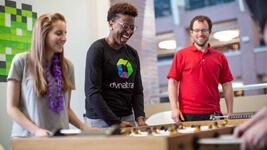 It is best to Disable problem detection during maintenance so that no notifications are pushed to system dashboards or through your third-party tools.